Their Skills, and Win More Softball Games! How to plan and run a killer practice, with just 5 minutes of prep time! At Softball Spot, our job is to make your life easy. So we created a step by step guide to running a killer practice that takes just moments to prepare. Complete with 17 illustrated drill sheets, simple coaching tips, and 5 minute-by-minute practice plans you can take right to the field! Every practice follows a proven formula, guaranteed to save you time, eliminate your coaching stress, and rapidly improve your team. So no matter how busy you are, what age level you're coaching, or how much experience you have, you can run an AMAZING fastpitch softball practice that your kids will love... starting tonight! 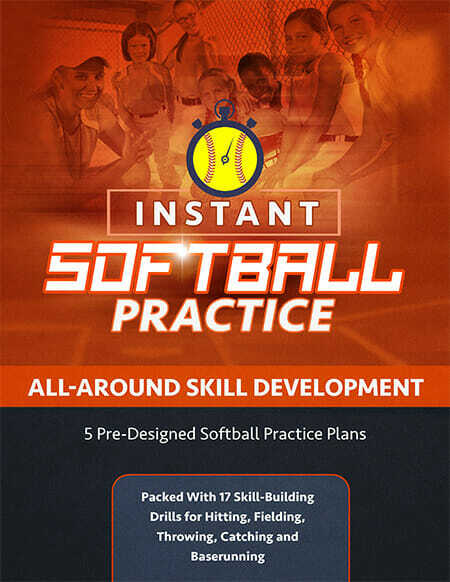 Click here now for instant access to Instant Softball Practice - All Around Skill Development. This is my first year coaching fastpitch, not to mention the first time I’ve worked with girls. The drills and practice plans have been a lifesaver. The girls love them because of the various things we do so they aren’t getting bored. I am looking forward to using the more advanced drills soon. Thanks for your help. I decided to post one of your practice plans in the dugout for each practice. Now the girls really look forward to seeing what’s on tap for the days practice. Thank goodness I found you!! I have been coaching boys baseball for ten years with my sons team. Now that he has moved onto high school it’s my daughters turn. I was looking for more information about softball specific drills and techniques. Your packet not only help me put together a better practice for my girls but it gave me several new drills that I wish I had for my boys teams!! Where have you been all my life! Great job!! I will pass your web site onto all the Dad’s that I know. This has been the best investment im my coaching development for sure!